3) As a complete surprise comes Lost Trail. A little research doesn’t reveal very much. Lost Trail seem to hide away in a dark forest in Burlington, North Carolina, but who knows? According to the website, they (Zac and Denny) deal in skeletons and ash. Lost Trail also deal in weird sounds, radio voices, analog, static, drones and cassettes. They are quite prolific. I’m listening to A Stained August for the Jetcrash and, frankly, it’s awesome and perfect for watching and listening to the death of summer and the arrival of the winter. What is different to other ambient drone stuff? These guys somehow intrigue and capture the imagination. Great titles and artwork- ‘Freeway Meadows of Cold Corrosive Acid’ anyone? Hypnotic and masterful. What heartens me the most is that this is yet another example of artists who are fearless. Not famous, hidden, yet incredibly good. I wish them well. Words: Keefy How (Lost in the woods with Wickerbird AND Lost Trail). 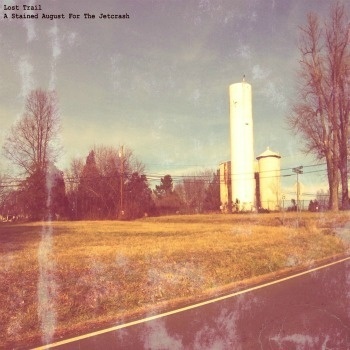 Lost Trail Bandcamp. Facebook. Soundcloud. Website. Twitter. Posted in Ambient, reviewsTagged A Stained August for the Jetcrash, Ambient, drone, experimental, Lost TrailBookmark the permalink.